Steaks, pork chops, and other grilling meats are often the focus of cookouts, but every grill master should also know how to grill asparagus. A great summertime treat, asparagus is a very healthy way to finish off your family cookout or summer grilling party. Here are a few quick facts about that tasty green stalk. Asparagus is low in calories. Unlike the majority of grillable treats, it makes an excellent low-calorie side. Like other green vegetables, asparagus is full of vitamins, including folic acid, potassium, and vitamin C.
Asparagus stalks are high in antioxidants. Grilled asparagus is a quick and tasty dish that can be served alongside your favorite grilled meats, veggie burgers, or tofu. 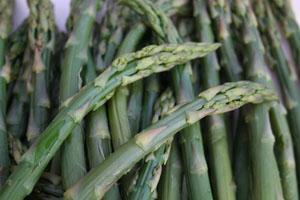 Because of its fiber content, asparagus also makes a hearty main dish for vegetarians and vegans. Below are a few ways to grill up the yummy springtime vegetable. This recipe is a basic, flavorful way to grill asparagus. Drizzle freshly cleaned asparagus with extra-virgin olive oil. Sprinkle spears with sea salt and crushed black pepper to taste. Place spears on a preheated grill, and cook for two minutes per side. Sprinkle with garlic salt immediately after removing from heat, and serve. Because of its long, thin shape, asparagus spears make the perfect filling for thin cuts of meat. Just follow these simple directions to create a gourmet meal for family or friends. Use a meat mallet to pound pieces of chicken until they are thin enough to wrap around the asparagus. Season the meat as desired. Place two or three fresh asparagus spears in the center of each piece of meat. Grill over medium to medium-high heat until the chicken is cooked through. Note: Ensure the asparagus spears are not touching the grates of the grill during cooking, which can cause your vegetables to burn or char. This dish can be served with or without Hollandaise, a sauce commonly paired with asparagus spears. First, drizzle extra-virgin olive oil over the vegetables you want to grill. There are many types of veggies that work. A great combination is asparagus, eggplant, zucchini, and chopped squash. If the vegetable is particularly starchy, like squash, you will need to cut it into small chunks or cubes. Next, season the vegetables with salt, pepper, and other flavorings. Garlic, rosemary, or dill all make great additions to the vegetables' fresh flavors. Place vegetables in the center of a wide sheet of heavy-duty aluminum foil. The foil sheet should be long enough to double up with the veggies inside of it. Fold the sheet over, and cinch at the edges. Be sure leave enough room to create a steam pocket inside. Cinch the edges of the foil upward so steam or liquid goes up and not down into the grill, which could cause flaming or even a fire. Grill the packet for five to six minutes, depending on the size and density of the vegetables inside. The veggies will be done when they are tender. Note: Vegetables are not the only food items that can be grilled using a foil packet. Many types of fish and meat do very well in foil. The packet can also prevent them from crumbling or sticking to the grill. There are many ways to grill asparagus and other seasonal vegetables. It just takes a little time and some creativity to learn how to grill asparagus and make an extra-special side for your cookout or family gathering.